Please find below our opening hours for the Christmas holidays. 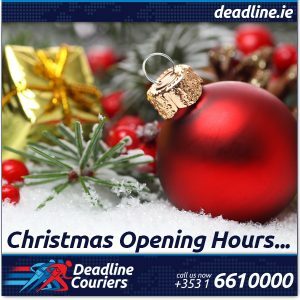 Please contact us at 0035316610000 or sales@www.deadline.ie if you have any query or require some critical parcel delivery around these dates. May we take this opportunity to wish you and all your close ones a very Happy Christmas and a 2016 full of Peace, Joy and Success.